Temperature controllers for refrigeration service designed to maintain sufficient pressure, with evaporative condensers and cooling towers. Low refrigerant pressure, due to abnormally low temperature cooling water, reduces the capacity of the cooling system. Two management systems for mechanical and atmospheric thrust and evaporative condensers are given in Fig. 14-23 and 14-24. Control opens the contacts when the temperature drops. These contacts are wired in series with the motor fan. Or they can be connected to the pilot fan motor controller. Opening contacts stops the fan cooling water temperature falls to a specified minimum value. This value corresponds to minimum head pressure for correct operation. The control system is shown in Fig. 14-24, close contacts on the decrease of temperature and wired in series with normally closed valve or solenoid valve. Contacts, open the valve, when the low temperature cooling occurs. 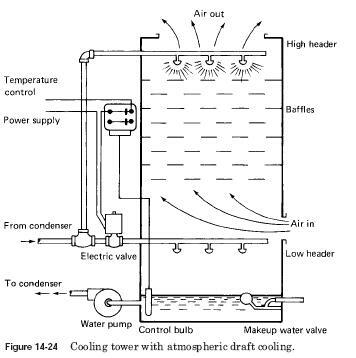 The cooling water flows through the low header in the atmospheric tower. This reduces the effect of cooling and pressure increases. Float switches are used to control the level of water in a cooling tower. Automatic float switches provide automatic control fuel tank or sump pumps. They are built in several styles, and can be supplied with several types of accessories that provide a rod or the operation of the network and in the wall or floor mounting. The sensor system can also be used. There are hundreds of types of sensors. They typically terms of the level of water with the help of two sensors. When the water contacts probes, it causes a small current (low voltage) to flow and the energy of the electromagnetic relay, which, in turn, causes the water to be turned off. When the water level was below two probes and complete schema, not normally closed relay contacts are closed relay trip. This causes water electromagnetic energy. 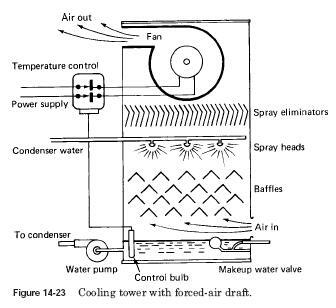 This allows makeup water flow in cooling towers, until it reaches a point where the probes immersed in the water, and the cycle repeats.